This project deals with energy use and reducing our carbon footprint. Please read the following article http://physics.ucsd.edu/do-the-math/2011/07/galactic-scale-energy/ from a blog called Do The Math (Uh-oh!). The Galactic Energy Scale article assumes our global rate of energy usage will grow by 2.3% per year starting at 12 terawatts (TW) right now. What is a watt? How many watts are in a terawatt? The author says this 12 TW amounts to 2 kw per average global citizen. How many such citizens is he assuming? How many 100 watt light bulbs could each average global citizen keep burning every second with their share of the energy usage pie? Write down an exponential equation for Energy Usage (E) as a function of time in years (t). Rewrite your equation with the input for time now being centuries not years. What is the doubling time? The author claims we currently “receive” about 7,000 TW of energy from the sun on the land mass. Plug this into your equation to determine in how many centuries we will be using this much energy ourselves. The author claims that if we continue 2.3% annual energy growth, then in 1,350 years we will be using as much energy as the sun itself! How much energy is this? Why is using this much energy not possible according to the author? In the third graphic there is a point labeled “steel melts”. What does this point represent in terms of the graphic? What conclusion does the author reach? Do you agree or disagree? Explain! The article talks about global warming at the end. Global warming is confusing because the hydrocarbons we are putting into the atmosphere absorb infrared radiation which the Earth radiates; but the hydrocarbons don’t absorb as much of the visible light coming from the sun. This is why the carbon dioxide in the atmosphere has a warming effect instead of cooling. 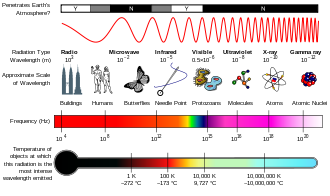 Visible light has a wavelength around 500 nanometers while infrared is around 10 micrometers (1,000 nanometers equals 1 micrometer). How much longer (what factor) is the wavelength of infrared light compared to visible? Insert a new column for total energy use per year in the United States. Convert this to TW (note the BTU’s are per year). Roughly what percentage of the world’s total energy usage is consumed by the US? What percentage of the world’s population lives in the US? Which of the 4 sectors has experienced the largest % decrease from 2007 – 2013? Information to help with reduction and offsets:Next, we will determine how much energy you use and what you can do about it. Use the following table to figure out how you could reduce your carbon “footprint” by at least 1,000 lbs of CO2 in 1 year. You must create a spreadsheet which lists each of your offsets AND how much of each quantity from Energy Used to Evergreens Planted you are saving in 1 year! You must save at least 1,000 lbs of CO2 in 1 year. Chart of Energy Usage, CO2 Emitted, and Equivalent Resources per month in One Household based on Activities per Week. You can use this information to estimate how much CO2 you produce in different activities like drying clothes, taking a shower, watching TV, etc. From here you can modify your activities and calculate your REDUCTION in CO2. 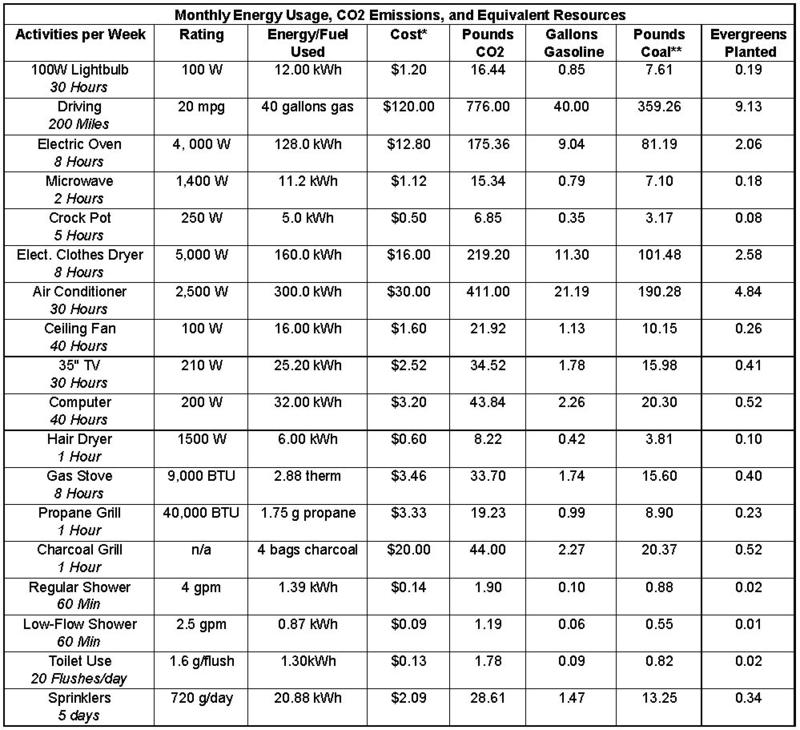 For example – from the chart you can figure out that 1 hour of putting your clothes in the dryer uses: 219.2 lbs CO2 per month divided by 8 hours per week = 6.85 lbs CO2 per hour. Therefore, if you decided to hang your clothes to dry, you would REDUCE your CO2 footprint by 6.85 lbs.